A view from the river. Atlantic white cedar trees along the Perdido River. Water lilies float atop on of the wetlands found on a side channel of the Perdido River. A light fog on the water at the put-in. A fun family friendly day or overnight paddling trip down one of the South's last "high quality free-flowing" blackwater rivers. 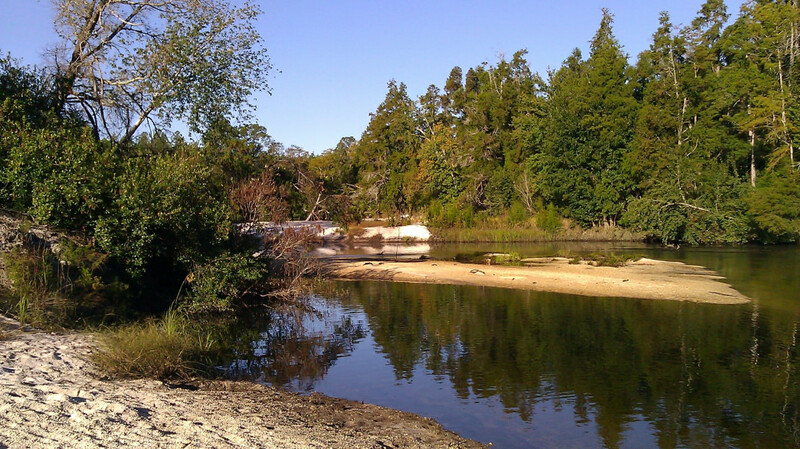 This beautiful river winds past Atlantic white cedar bogs, countless inlets to explore, and amazing white sandbars where you can stop for lunch, take a swim, or camp overnight. The river itself isn't difficult to paddle, its getting to the put-in and take-out that's the hard part over old logging roads that seem to all have the name "River Road". Spring and summer are the best times to paddle the Perdido. In the spring white water lilies bloom along side channels and ponds while white dogwood brighten the scenery. In the summer this is simply a great river to swim in. Remember, no lifeguards so swim at your own risk. Keep an eye on the weather. Many creeks and streams flow into the Perdido and after a good rain the river swells and floods the surrounding banks making it dangerous to paddle during these times. It is recommended to keep your dog on a leash because there are alligators in the river. One of the South’s famous “black water” rivers, the Perdido forms the border between Alabama and Florida as it meanders to the Gulf of Mexico. This 13.5-mile paddle is fun for young and old alike. Along the banks you will see Atlantic white cedar bogs and small inlets that invite you to paddle up them to view beautiful ponds dotted with flowering lily pads. The banks are dotted with glistening white sand bars, perfect places to stop for lunch, take a swim, or camp for the night. And keep your eyes to the skies for osprey and majestic bald eagles soaring overhead. A blackwater river is one where the water is tinted a dark tea color due to the tannin from the trees that line its banks. The bottom is soft and sandy. 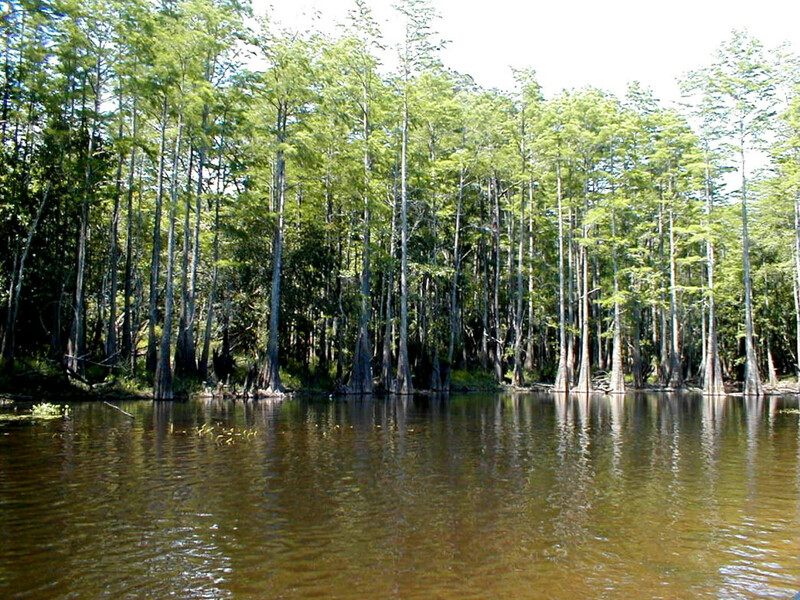 Along this winding river that forms the border between Alabama and Florida you will be floating past beautiful Atlantic white cedar bogs and numerous channels and inlets that beg you to paddle up them and explore. Hidden away on some of these side paddles are tranquil ponds and wetlands where water lilies flower white in the spring. Around each bend is a magnificent white sandbar perfect for taking a break, eating a snack, taking a swim, or camping. 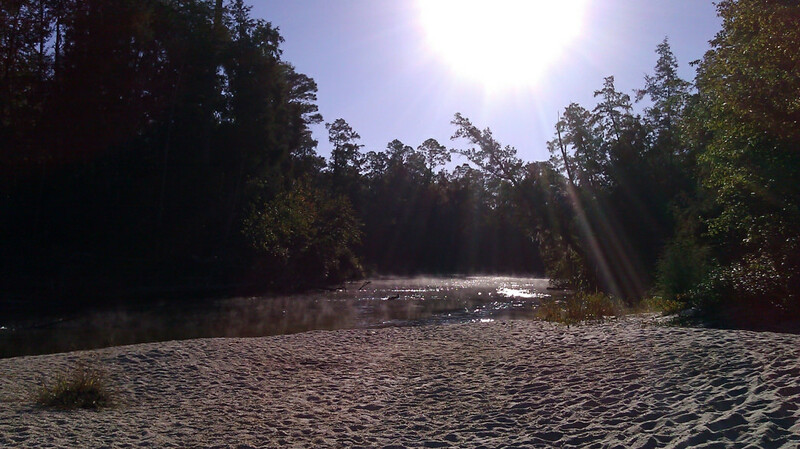 Camping is allowed on any sandbar on the Alabama (west) side of the river. There are also a few trail shelters available and while free they must be reserved by contacting the Department of Conservation at (251) 626-5153. The best place to swim is a huge sandbar about 12-miles into the trip just past the Barrineau Park Bridge. Keep your eyes to the sky as you paddle for red tail hawks, osprey, and bald eagles soaring overhead. And watch for aquatic wildlife as well including American alligators. Alligators are naturally afraid of humans but keep your eyes peeled and keep children and dogs close at hand. It’s best to keep dogs leashed. This is a great float trip for seasoned paddlers with plenty of side channels to explore. The Perdido is an excellent beginners paddle however the difficulty reaching the put-in/take-out makes it difficult in the event of an emergency. If you’re into wildlife you’re in for a treat with osprey and bald eagles soaring overhead, white tail deer, and maybe an alligator. And there is a possibility you may see a Florida black bear roaming the banks, but while their population is increasing, sightings are rare. Fishermen will love to wet there hook here but remember you are straddling the Alabama and Florida state line so two licenses will be required. For Alabama visit http://www.outdooralabama.com/content/freshwater. 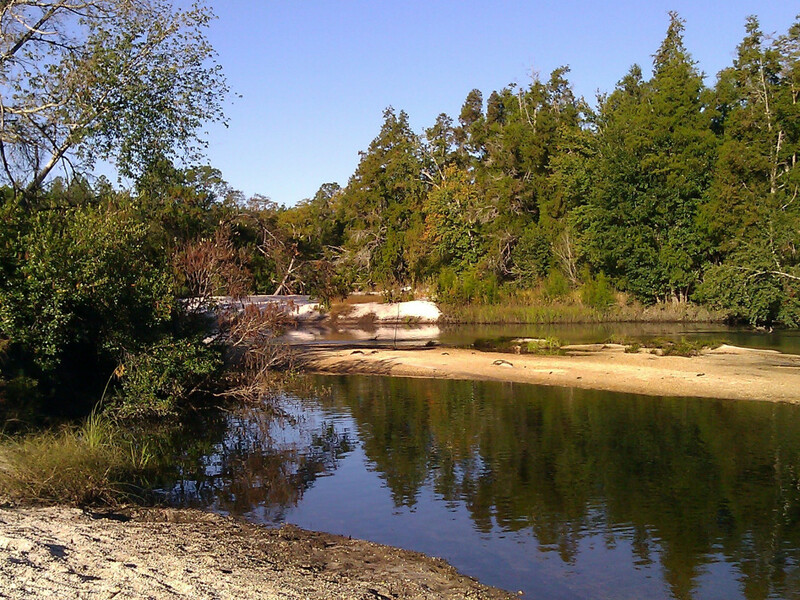 For Florida go to http://myfwc.com/viewing/recreation/wmas/cooperative/Perdido-River. Directions to the North Put-In: In Robertsdale from the intersection of CR 87 and AL 112, take AL 112 (Old Pensacola Road) south 1.7-miles. Turn left onto the dirt River Road. Travel 1.7-miles and turn left to stay on River Road. Travel 3-miles and turn right onto an unnamed dirt road. Follow it around for 0.4-miles to the trailhead next to the river. Directions to the South Take-Out: From Robertsdale at the intersection of AL 87 and AL 112, take AL 112 (Old Pensacola Road) south 9.4-miles and turn left onto Duck Place Road (Barrineau Park Road). Immediately after you turn onto the paved road turn right onto the dirt River Road. Follow the road for approximately 1.7-miles and turn left onto Nims Fork Road. Continue 0.3-miles and turn right onto an unnamed road. Travel about 0.5-miles around a curve to the left, then turn right onto another unnamed road. Follow this road approximately 0.4-miles, crossing railroad tracks, and take a right at the fork. Travel another 0.7-miles and turn left onto yet another unnamed road. In 1-mile the road makes a sharp curve to the right. After the curve, continue another 1.7-miles to a clearing where you can park. The trail begins on the north side of this parking area. GPS Coordinates: N 30.657955, W -87.404067. Keep in mind that hunting is allowed on the property Visit www.outdooralabama.com/season-and-bag-limits for dates. Camping is allowed on any of the sandbars on the Alabama (west) side of the river. Shelters are also available but are also shared by hikers on the Perdido River Trail and must be reserved. 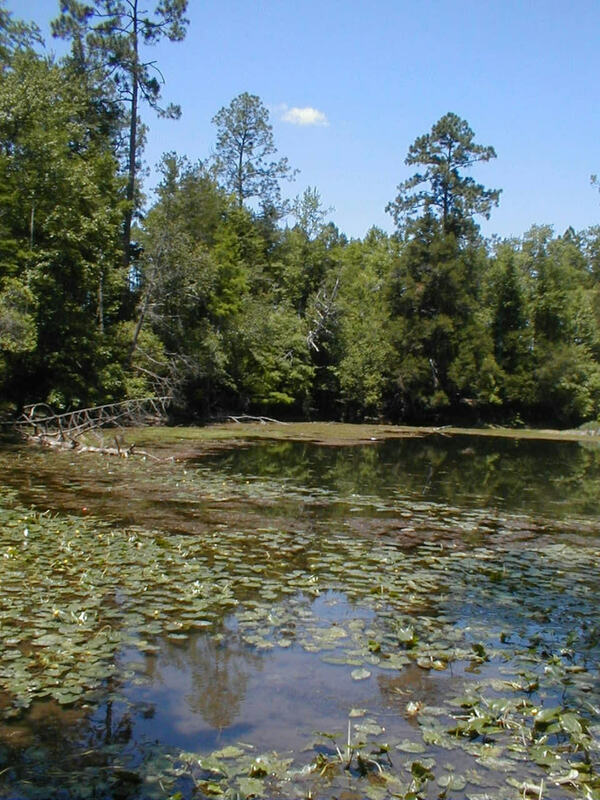 Visit Alabama’s Forever Wild program at http://www.outdooralabama.com/forever-wild-land-trust for contact information.